Infamy! You want it! How to get it? Roll some sweet, sweet loot dice with your thief pals and then beat them to the punch to buy excellent things at the Thief’s Market with the loot. 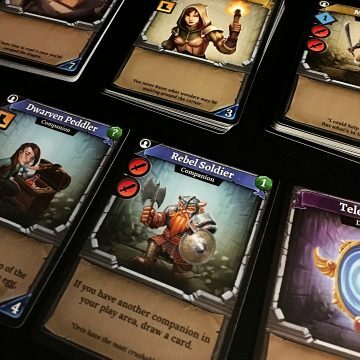 Thief’s Market from Tasty Minstrel Games really is that quick, simple & fun. Let me run down the basics for you. The market deck consists of three phases (A, B & C) – some cards being removed so the spread of items is a little different each game. 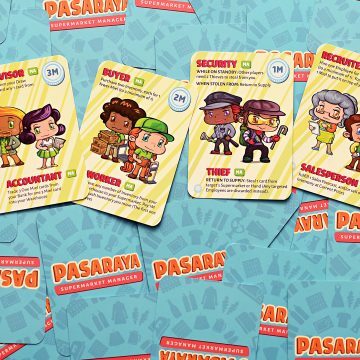 With 5 cards out in the market, players then roll the loot dice to divide between themselves – and I think this is the most fun part of the game with how it lets players interact. Say I would roll the dice as first player – I’d then select a number I want to keep, and pass them to the next player. That person can then choose to roll & select their own, or take my portion of the loot (-1 die), leaving me to roll the loot dice when they come back around to me! Oh, it’s so tricksy. Once everyone has a portion of the loot, you head to market. There’s a variety of item/plan/henchmen cards to purchase in the thief’s market, with myriad bonuses and effects. 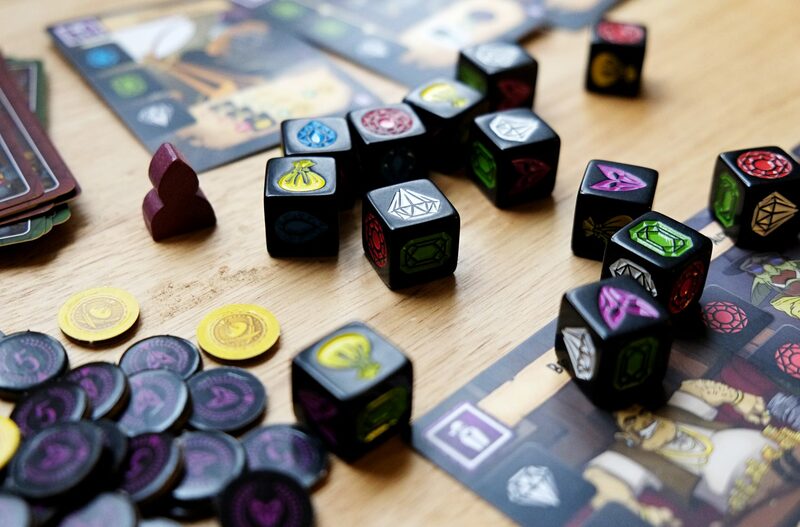 Many give you during-game bonuses, allow you to tinker with dice (great for some luck mitigation!) or provide end-game boosts for infamy. Early cards in the A phase will be simpler effects, but allow you to build up some nice synergies as you get through stages B and C of the market deck. By playing through three rounds of items in the market, the game has a finite end to aim for, keeping your strategy somewhat in check and directing you as far as your purchases go. 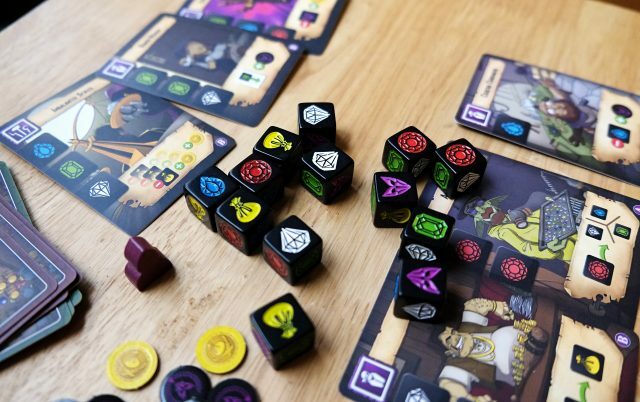 As well as the bright, fun art and clean graphic design of the game and rules, this small box has quality components – nice cards and tokens make a difference to play, and the great chunky dice are a pleasure to toss each round. 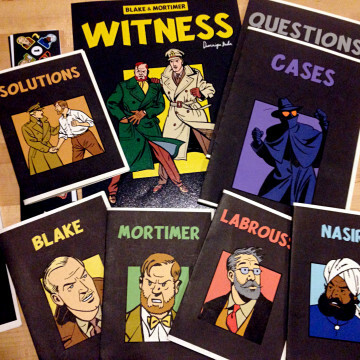 Small box games can sometimes suffer from lack of detail in these regards, so it’s nice to see it hasn’t been looked over for Thief’s Market. It’d definitely be a draw visually for folks who are already into fantasy-D&D themed things, and colourful dice icons are eye-catching to bring in some interest, too. 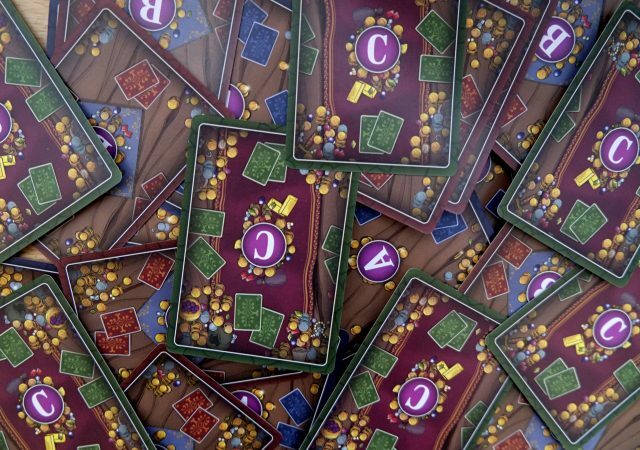 Thief’s Market is a game from Tasty Minstrel Games, designed by Dave Chalker. Art by Rob Lundy & graphic design by Adam P. McIver. Plays 3 – 5 people in approximately 30 – 50 minutes. Thanks to Dave Chalker for providing us with a copy of Thief’s Market to roll our way through! CLANK! You’re Bit. By a dragon. An Angry One.